problems and discomfort as a result of pH extremes. Phenytoin (HA acid; pKa 8.3) injection must be adjusted to pH 12 with sodium hydroxide to ensure complete ionization and maximize water solubility. In theory, a pH of 10.3 will result in 99.0% of the drug being an anionic water-soluble conjugate base. To lower the concentration of phenytoin in the insoluble acid form even further and maintain excess alkalinity, the pH is raised to 12 to obtain 99.98% of the drug in the ionized form. Even then, a cosolvent system of 40% propylene glycol, 10% ethyl alcohol, and 50% water for injection is used to ensure complete solution. This highly alkaline solution is irritating to the patient and generally cannot be administered as an admixture with other intravenous fluids that are buffered more closely at physiological pH 7.4. This decrease in pH would result in the parent unionized phenytoin precipitating out of solution. Tropicamide is an anticholinergic drug administered as eye drops for its mydriatic response during eye examinations. With a pKa of 5.2, the drug has to be buffered near pH 4 to obtain more than 90% ionization. The acidic eye drops can sting. Some optometrists and ophthalmologists use local anesthetic eye drops to minimize the patient's discomfort. The only atom with a meaningful pKa is the pyridine nitrogen. The amide nitrogen has no acid-base properties in aqueous media. Adjustments in pH to maintain water solubility can sometimes lead to chemical stability problems. An example is indomethacin (HA acid; pKa 4.5), which is unstable in alkaline media. Therefore, the preferred oral liquid dosage form is a suspension buffered at pH 4 to 5. Because this is near the drug's pKa, only 50% will be in the water-soluble form. There is a medical indication requiring intravenous administration of indomethacin to premature infants. The intravenous dosage form is the lyophilized (freeze-dried) sodium salt, which is reconstituted just prior to use. The pKa can have a pronounced effect on the pharmacokinetics of the drug. As discussed previously, drugs are transported in the aqueous environment of the blood. Those drugs in an ionized form will tend to distribute throughout the body more rapidly than will un-ionized (nonpolar) molecules. With few exceptions, the drug must leave the polar environment of the plasma to reach the site of action. In general, drugs pass through the nonpolar membranes of capillary walls, cell membranes, and the blood-brain barrier in the un-ionized (nonpolar) form. For HA acids, it is the parent acid that will readily cross these membranes (Fig. 2.5). The situation is just the opposite for the BH+ acids. The unionized conjugate base (free amine) is the species most readily crossing the nonpolar membranes (Fig. 2.6). Consider the changing pH environment experienced by the drug molecule orally administered. The drug first encounters the acidic stomach, where the pH can range from 2 to 6 depending on the presence of food. HA acids with pKa's of 4 to 5 will tend to be nonionic and be absorbed partially through the gastric mucosa. (The main reason most acidic drugs are absorbed from the intestinal tract rather than the stomach is that the microvilli of the intestinal mucosa provide a large surface area relative to that found in the gastric mucosa of the stomach.) In contrast, amines (pKa 9-10) will be protonated (BH+ acids) in the acidic stomach and usually will not be absorbed until reaching the mildly alkaline intestinal tract (pH 8). Even here, only a portion of the amine-containing drugs will be in their nonpolar conjugate base form (Fig. 2.4). Remember that the reactions shown in Figures 2.3 and 2.4 are equilibrium reactions with Ka values. Therefore, whenever the nonpolar form of either an HA acid (as the acid) or a B base (the conjugate base of the BH+ acid) passes the lipid barrier, the ratio of conjugate base to acid (percent ionization) will be maintained. Based on Equations 2.3 and 2.4, this ratio depends on the pKa (a constant) and the pH of the medium. Figure 2.5 • Passage of HA acids through lipid barriers. Figure 2.6 • Passage of BH+ acids through lipid barriers. ionization for ephedrine (pKa 9.6; Eq. 2.4) and in-domethacin (pKa 4.5; Eq. 2.3) at pH 3.5 (stomach), pH 8.0 (intestine), and pH 7.4 (plasma) (see examples 1, 6, and 7 in Table 2.2). Of course, the effect of protein binding, discussed previously, can greatly alter any prediction of biodistribution based solely on pKa. Initially, the design of new drugs was based on starting with a prototypical molecule, usually a natural product and making structural modifications. Examples include steroidal hormones based on naturally occurring cortisone, testosterone, progesterone and estrogen; adrenergic drugs based on epinephrine; local anesthetics based on cocaine; opiate analgesics based on morphine; antibiotics based on penicillin, cephalosporin and tetracycline. 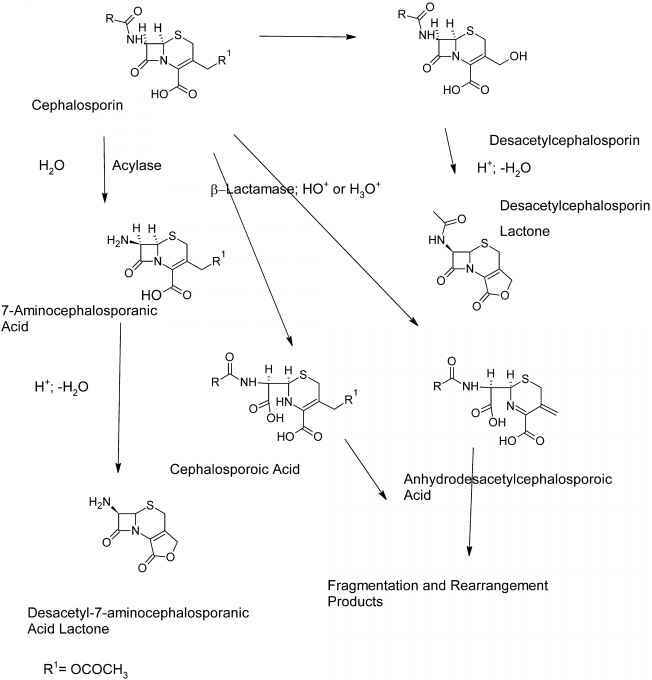 Examples of prototypical molecules that were not natural in origin include the antipsychotic phenothiazines, bisphosphonates for osteoporosis, benzodiazepines indicated for various CNS treatments. Although prototypical molecules have produced significant advancements in treating diseases, this approach to drug development is limited to the initial discovery of the prototypical molecule. Today, it is more common to take a holistic approach that, where possible, involves understanding the etiology of the disease and the structure of the receptor where the ligand (drug) will bind. Increasing computer power coupled with applicable software, both at reasonable cost, has lead to more focused approaches for the development of new drugs. Computational methodologies include mathematical equations correlating structure with biological activity, searching chemical databases for leads and rapid docking of ligand to the receptor. The latter requires 3D structure information of the receptor. Originally crystallized enzymes were the common receptors, and their spatial arrangements determined by x-ray crystallography. Today's software can calculate possible 3D structures of protein starting with the amino acid sequence. (c) to design a test set of compounds to maximize the amount of information concerning structural requirements for activity from a minimum number of compounds tested. This aspect of medicinal chemistry is commonly referred to as quantitative structure-activity relationships (QSAR). Equation 2.5 states that a defined change in chemical structure results in a predictable change in physiological action. The problem now becomes one of numerically defining chemical structure. It still is a fertile area of research. What has been found is that biological response can be predicted from physical chemical properties such as vapor pressure, water solubility, electronic parameters, steric descriptors, and partition coefficients (Eq. 2.6). Today, the partition coefficient has become the single most important physical chemical measurement for QSAR studies. Note that Equation 2.6 is the equation for a straight line (Y = mx + b). To understand the concepts in the next few paragraphs, it is necessary to know how to interpret defined pharmacological concepts such as the ED50, which is the amount of the drug needed to obtain the defined pharmacological response in 50% of the test subjects. Let us assume that drug A's ED50 is 1 mmol and drug B's ED50 is 2 mmol. Drug A is twice as potent as drug B. In other words, the smaller the ED50 (or ED90, LD50, MIC, etc. ), the more potent is the substance being tested. The logarithmic value of the dependent variable (concentration necessary to obtain a defined biological response) is used to linearize the data. As shown later in this chapter, QSARs are not always linear. Nevertheless, using logarithms is an acceptable statistical technique (taking reciprocals obtained from a Michaelis-Menton study produces the linear Lineweaver-Burke plots found in any biochemistry textbook). Now, why is the biological response usually expressed as a reciprocal? Sometimes, one obtains a statistically more valid relationship. More importantly, expressing the biological response as a reciprocal usually produces a positive slope (Fig. 2.7). Let us examine the following published example (Table 2.5). The BR is the LD100 (lethal dose in 100% of the subjects). The mechanism of death is general depression of the CNS. Figure 2.7 • Plot of (BR X 1,000) versus (PC x 0.01). 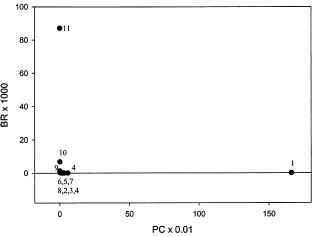 What the percent ionization of indomethacin pka 4.5 in intestinal tract buffered at pH 8? Is indomethacin pka 4 will be absorbed from the stomach rather than the intestinal mucosa? Why is phenytoin insoluble in acid?